Mini label is our newest model to the unique digital price tag family. This lightweight and small price tag includes dynamic pricing and RFID and can be provided with attachable anti-theft (including AM). 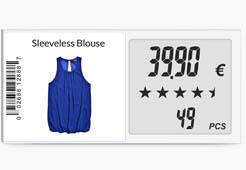 With EllaFashion digital price tags the retailer can change prices within just a push of a button. The price tags can also show sales and various campaign information. Digital price tags are a modern and easy way to keep the pricing up to date and have the same prices regardless of the sales channel. It is also a perfect opportunity for a chain of stores to have the same pricing across countries in different currencys. For the consumer, a digital price tag is a guarantee that the product price is always correct and clearly presented. The light-weight digital price tags show the previous and current prices in a clear way. They are available in black and white. The small, light-weight digital price tags can be neatly attached to all kind of clothes from silk blouses to rough jeans or even shoes. The superior visual and functional properties of EllaFashion Solution make it an attractive choice for all kinds of environments; from an exclusive boutique to outlets and anything in between. The price optimization tool follows the sales plans made for the product batches and changes the price according to demand, when needed. Retailer saves money and receives a reliable tool for maximizing sales, profit and margins. Inventory is automatic and storage is always up to date. Flexible and remote-controlled pricing releases the sales personnel to engage in serving the customers. The customer service becomes faster, accurate and easy and the customer’s shopping experience is more comfortable than ever. 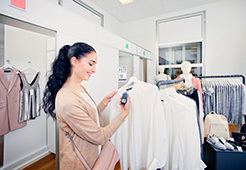 EllaFashion Solution consists of digital price tags, two-way radio equipment and controller software. It provides dynamic pricing, real-time inventory and attachable anti-theft. 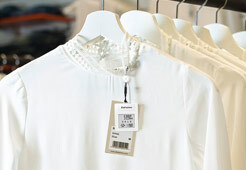 The digital price tags have a two-way communication capability. The software is in contact with each digital price tag and keeps a precise record of the inventory. EllaRetail Shelf Labels (ESL) take the best qualities out of e-paper technology and paper-like look. The shelf edge label shows product and pricing information and the photo sticker is available in four colors. On top of that, there is a possibility to indicate the product’s rating from one star up to the top five. Product information stickers display for example product name and code, EAN or QR-code. Pricing information is dynamic and easily updated. For promoting purposes and campaigns a percentage can be shown with wording like Offer or Sale. EllaRetail Pricing Solution’s wireless labels employ a two-way radio communication and can be easily affixed to shelf edge. The digital price tags show multiple currencies. EllaFashion Solution brings a modern pricing and sales tool for fashion retailers. The pioneering technology is innovated and developed in Finland. All price tags are recyclable. The e-paper technology allows dynamic, clearly presented and up to date pricing. EllaRetail Shelf Labels combine product and pricing information in a customer-friendly way. EllaFittingRoom Solution enables the customer’s shopping experience to be more pleasant than ever, while it is easy to call for assistance and ask for another size, color or different garments via tablet. The shop assistance’s mobile shows the clothes the customer orders to the smart fitting room, so it’s easy to recommend additional items that match with them. The system keeps count of garments (i.e. EllaFashion digital price tags) arriving and leaving the smart fitting room. This is to silently notify of possible unusual behavior, like too many of the same items or a mixture of women’s, men’s and children’s clothes. The efficient anti-theft system leads to minimum shrinkage. The EllaFittingRoom Solution also creates many reports, like the top tried on items. The tablet in the smart fitting room shows garment information and helps the customer to order other items to the fitting room. The EllaFashion digital price tag guarantees the customer, that the price is always correct and clearly presented.